Loans are a major decision for any person. You need to consider every aspect that goes along with a loan, especially the interest. 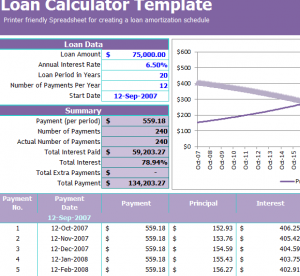 The Loan Calculator is a great way for you to calculate a potential loan, the interest, the number of payments, and the monthly cost. This template guides you through all of these processes and gives you valuable insight into whether or not a particular loan will be a good decision for your financial situation. After successfully downloading the free file below you can start by entering the details of your potential loan at the top of the page. The template has a list of items, just go down each row and fill out the spaces with the information mentioned to the left. The “Loan Data” table is where you will fill out the: loan amount, annual interest, loan period, number of payments, and the start date. The “Summary” table will take the information you filled out above and calculate your monthly payments, the interest you’ll pay over time, and everything else you’ll need for your new investment. you have a way to keep track of all your loan information and be prepared for the future. Nothing is better than financial security and this tool will help you achieve that goal!